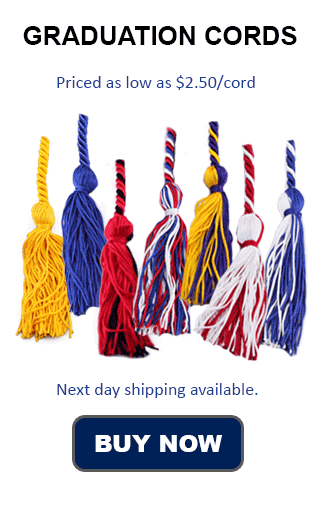 Health occupations student graduation cords are found in a variety of colors. The color at your high school depends on your school and what color they approve for wearing at graduation by students in health occupations. Various schools may use any number of colors to represent this honor, for example, some use green, purple, maroon, navy blue, or white honor cords individually or double tied. The colors used for honor cords all stand for something. Most often, these meanings are determined by the individual school from which students are graduating, and the most common honor cord colors come in the school's colors. For more information on meanings, see our graduation cord meanings page. HOSA, the acronymn stands for Health Occupations Students of America. HOSA graduation honor cords are provided by or through that organization. Because that organization targets students at the secondary, or high school level, HOSA honor cords are shorter (at 54" as opposed to the 70" cords offered by Honors Graduation). * The cords offered by Honors Graduation for students in health occupations are not offered in conjunction or affiliation with HOSA. Students are encouraged to participate in clubs, honor societies, and organizations that help them develop their skillset and interests. At Honors Graduation, we hope that schools who make the extra steps to recognize student achievement will consider our honor cords. *Information taken from the official HOSA graduation cord provider website on March 24, 2013.